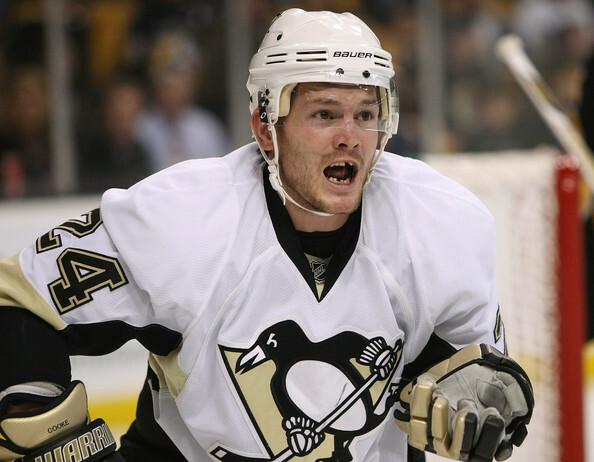 Forward/Professional Instigator Matt Cooke, 31, is going to stay with the Pittsburgh Penguins, reaching terms on a three-year deal worth $1.8 million annually. It's a bit of a surprise move, considering that Ray Shero normally doesn't sign players 30 or older to deals of this length. That being said, the price is probably right, the guy scored 30 points on the third line, he raises his game in the playoffs, and his agitation of the opposition can be invaluable (as long as it's not putting a target on his teammates' backs). Plus, I certainly don't mind seeing the Pens keep at least a few of their own free agents from one year to the next. Last season, Cooke had 15 goals, 15 assists, and this controversial hit on Marc Savard. He chipped in with four playoff goals in 2010 and won a ring with the team in 2009. Not a fan of this move (or of Cooke). I know he does a lot of good scrappy things, but it's hard to criticize the Scott Hartnell's of the world with Cooke on our team. He crosses the line from pest to goon too much. Love this deal. Cooke was their best winger last year (Dupuis being a very close second) and candidly, I'd rather not see him facing us. When Cooke starts biting people and grows an Ogie Ogilthorpe 'fro, then I'll stop criticizing Hartnell so much. His legs and skills shouldn't degrade from ages 31 to 34, $1.8m isn't a bank-breaker, and he pisses off the right people. To reiterate: love this deal. I like the signing. Sorry, Wintermute but I think Cooke proves his value in the playoffs time and time again. Despite his thuggish ways he finds the net more often in the playoffs than our other wingers. His style is suited to the playoffs, whereas our other forwards known more for their defensive skills than their shooting ability tend to wilt. As I commented on here after the Savard hit, if GMs were really committed to cleaning up the league, they wouldn't continue to employ dirty players. In spite of everything they've done guys like Cooke and the infinitely worse Bryan Marchment always found work. Cooke's a nice player, and at times a necessary evil, but wow, if he's our best winger (as someone suggested) no wonder we didn't make it out of the 2nd round!